In an oasis of tranquility, right on the riverside in central Portugal, lies the carefully renovated Quinta da Moenda. The owner's residence was built in the former olive press and has a large south facing terrace with kiwis, lemons and grape vines. The main residence is currently a separate building from the apartments and has additional business development potential (restaurant, conference room), while the field behind the house and on the riverfront has potential for camping. Schools are in the vicinity. Five fully equipped self-catering apartments and a communal lounge have been created from the former distillery building. The building is surrounded by the main guest facilities, such as a patio with outdoor kitchen and BBQ, a modern sauna and a large saltwater pool with lawns. A footpath separates the guest area from the owner's residence. The apartments are certified as Casa de Campo and officially registered with Turismo de Portugal. Excellent guests reviews on Zoover, Tripadvisor and Booking.com. The apartments have the energy certificates A and B. The estate is located in a valley on the river beach, where fishing and swimming are possible. 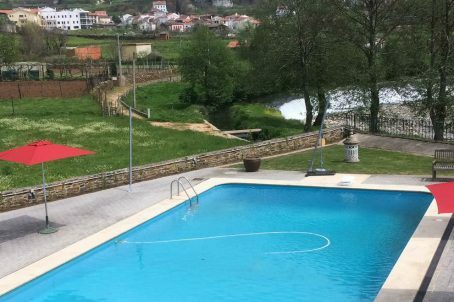 The beach as well as two historical cities, Viseu and Coimbra, are an hour drive away. Buildings and land: € 550.000. Business and business inventory: € 95.000.